Dubai: Occupancy in Dubai hotels rose to 89.6 per cent this year to beat last year’s performance by 4.2 per cent, boosted by the Dubai Shopping Festival (DSF), according to a recent HotStats report by TRI Hospitality Consulting. The festival, which ran from January 3 to February 3, is expected to have attracted 4.7 million visitors. Monthly hotel performance indicators this year beat last year’s figures. Average Room Rates (ARR) were up five per cent to $359.39; while Total Revenue per Available Room (TRevPAR) was boosted to $522.92 (Dh1,923.29) — the highest recorded across all the markets surveyed-resulting from the 10.2 per cent increase in Revenue per Available Room (RevPAR) to $321.85, as well as the 6.5 per cent rise in food and beverage (F&B) revenues. This contributed to a 14.5 per cent growth in Gross Operating Profits per Available Room (GOPPAR) reaching $279.30. “The DSF has got better and better every year, and this time is no exception. This mega-event offers a perfect start to the year for the tourism establishments in the city, and helps bridge the gap between the end of year holidays and European winter breaks,” said Peter Goddard, managing director at TRI Hospitality Consulting. Meanwhile, Abu Dhabi hotels also saw occupancy rise from the shopping festival in nearby Dubai. 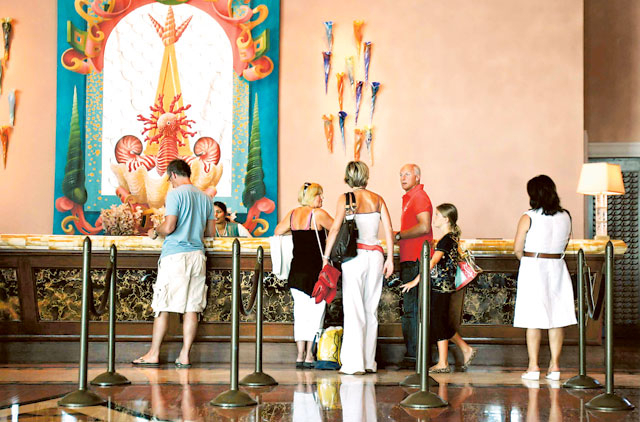 Hotels recorded a 10.8 per cent increase in occupancy to 71.7 per cent. However, ARR levels dipped 10.7 per cent in January to $167.77, dropping RevPAR by 5.3 per cent to $113.05. “Despite stronger demand, hotels in the capital have failed to capitalise these events to improve top line performances, simply due to the competition,” said Goddard. Additionally, F&B revenues were down around 15 per cent during the month, resulting in TRevPAR to drop 9.6 per cent to $241.16. Also, a two per cent rise in payroll affected bottom line profits, contributing to a 4.4 per cent drop in GOPPAR to $71.16. In Kuwait, meanwhile, hotels recorded a 6.1 rise in occupancy to 58 per cent; while ARR were up 10.2 per cent to $273.54, increasing RevPAR by 23.3 per cent to $155.58. Over in Egypt, occupancy in Sharm Al Shaikh was up 9.3 per cent to 57.2 per cent; and in Cairo, it rose to 5.9 per cent to 43.7 per cent. And in Saudi Arabia, hotels performance levels were not as strong as that of other regional markets. In Jeddah, occupancy dropped 3.7 per cent to 72.2 per cent; while in Riyadh, it dropped 1.3 per cent to 60.3 per cent.